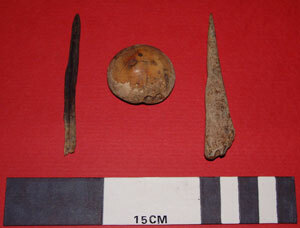 During the past week excavations in Trench 2 have produced a varied range of artefacts including stone, bone and antler. Read on for details of these discoveries. The area of Trench 2 immediately above the former entrance into High Pasture Cave continues to provide a rich assemblage of finds including stone, bone and antler, indicating that this location in the landscape had some special significance for the local inhabitants of Skye during the Iron Age. The image above shows two bone points found near to one of the hearth settings in the extension to the trench. These have been polished to form the point and may have been used as awls to make holes in leather or other materials. The item in the image between the bone points may be a knife pommel or gaming piece, which has been manufactured from a bone epiphysis (ball joint of a limb bone). This has been shaped to form a flat base, with a bevel on the edge. The red stain on the bone in the image may be from an iron rivet that has been inserted through it. 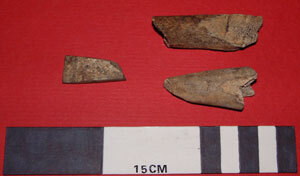 Finds of antler show cut and shaping marks, many of which have been made with an iron knife blade (see image below). 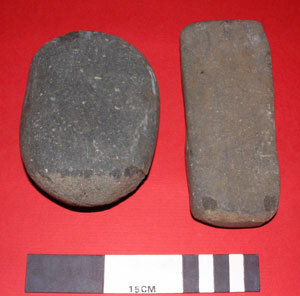 We have also recovered a significant number of stone pebble tools from this area of the trench including hammers and grinders. Some of the tools shown below were recovered in a cache of 23 pebbles from the area of the trench above the former entrance into the cave and may be part of a tool kit associated with metalworking at the site. It is possible that these tools were used for crushing and grinding the iron ore that can be found in the rocks close to the High Pastures site. Metalworking was most likely seen as a magical process in the Iron Age and it is possible that along with the significant numbers of pebble tools and anvil stones recovered from this area of the trench, other deposits such as charcoal and peat ash deposited in the pit above the former entrance may have been associated with the metalworking processes. 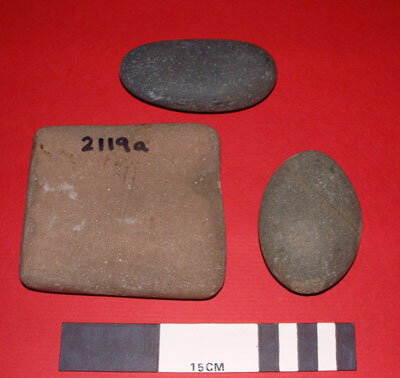 The prehistoric inhabitants of the area may have been placing deposits back in the ground to replace the removal of ore-bearing rocks to manufacture iron. 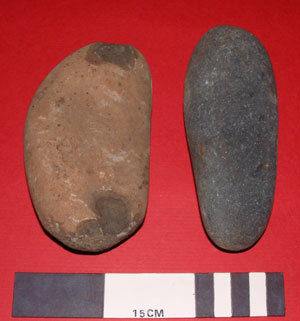 The stone tools come in a wide range of shapes and sizes, and while some of these were probably used in the manufacture of iron, it is also possible that their function might relate to a wider range of domestic processes. 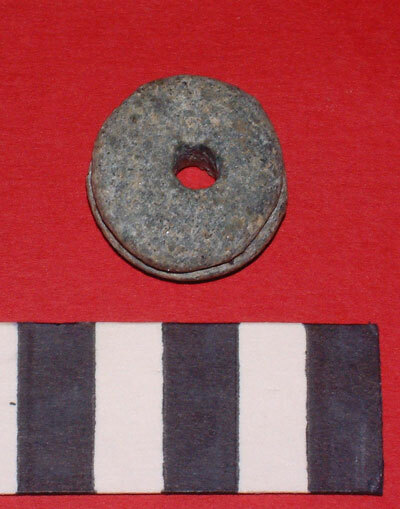 Another nice little find made in this area of the trench was the stone spindle whorl shown below, complete with a crudely cut groove running around its circumference. The excavations between the stonework and rubble fill of the Trench 2 extension have also recovered significant quantities of well-preserved animal bone and increasing numbers of shellfish remains. Animal bone includes pig, red deer, sheep/goat and horse, while the bones of wild mammals may also be present. 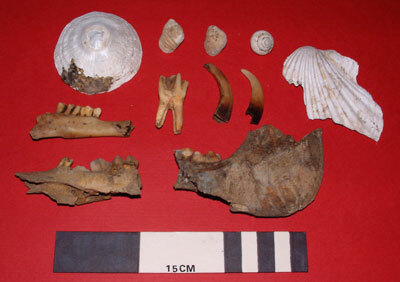 Shellfish include limpet, periwinkle, mussel, oyster, king scallop, clam and dog whelk, showing that the people living in the area during the Iron Age utilised both wild and domestic species for subsistance. The image below shows a few items recovered this week. Very interested to see ‘horse’ mentioned among the bone finds. Definite identification? and any more details possible, please? Great site: excellent for people like K and me who are not now in swim of word-of-mouth info, but still interested.